John Sinclair seems to be one of the figures from the Woodstock era who has held on to the ideals of the counterculture. It isn’t difficult to indicate his passion and unwillingness to budge on the beliefs that he has held onto since the hippie era. It was a breath of fresh air to see the spirit of the 1960s in person. The poet, activist, author, co-creator of the White Panther Party, and former manager of the MC5 hailing from Flint, Michigan has not wavered from his mentality of being free to do as he pleases. Sinclair is known for adhering to his beliefs despite the consequences and remains an icon of the counterculture. He explains that the real history of Woodstock has been distorted by what became a corporation, and controlled media. “Nobody knows anything about hippies. All of our real stories from the time period have been erased,” said Sinclair. He was arrested after giving two joints to a policewoman, which resulted in a mass protest by musicians titled the “Free John Now Rally”, which drew musicians such as John Lennon, Yoko Ono, David Peel, Stevie Wonder, Phil Ochs, and Bob Seger. This event led to the decriminalization of marijuana in Ann Arbor which has been reduced to a civil infraction within the city. 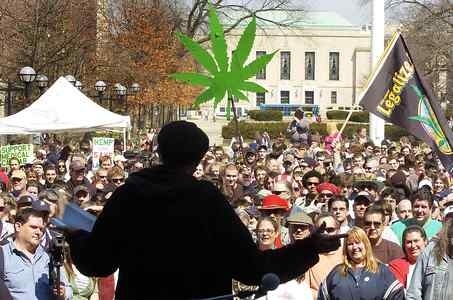 The annual pro-legalization Hash Bash rally held in Ann Arbor is also a result of the event. Sinclair’s legacy is also tied to Woodstock with the Abbie Hoffman incident. The member of the White Panthers, a group co-founded by Sinclair to aid the Black Panthers in achieving racial equality, rushed the stage during the Who’s performance and called for Sinclair’s release. This was met by some harsh words from guitarist Pete Townshend and the event has become a staple of the Woodstock 1969 festival. It seemed as though every action that Sinclair took gained the attention of subculture and authority. “I was a warrior because I thought we could overthrow the government. Once I figured out that we couldn’t, it seemed kind of stupid,” said Sinclair. Aside from what the government considered subversive behavior; Sinclair has not deviated from his part in the drug culture. The person responsible for indirectly decimalizing marijuana in Ann Arbor has been a strong advocate of legalizing the substance. In 2006 at the Cannabis Cup in Amsterdam, a prize-winning strain of Dutch marijuana was named in his honor. He explains his views on drugs as a different perception of the world. “You see the world in a different light. You don’t see it through the prism of popular culture,” said Sinclair. Sinclair is what one would call an independent artist to this day. He still reads his poetry of both old and new across the world and has recently released his new CD ‘Detroit Life’ which features Sinclair’s reading with his backing band the Motor City Blues Scholars. He also hosts his own weekly Internet program on Radio Free Amsterdam, which is available on podcast. “You can do whatever you want to do; this is America. But if you’re an artist you take a vow of poverty,” said Sinclair. John Sinclair at Hash Bash 2008 in Ann Arbor, MI on the first Saturday of April at High Noon.